If the Lord in his kindness were ever to grant me the opportunity to pursue doctoral studies in theology, the dissertation I would like to pursue (at least these days) would be something like: “An Infinite Multiplication of Happiness: Chapters 24-25 as the Heart and Climax of Anselm’s Proslogion.” Anselm’s Proslogion is my favorite theological book. Unfortunately, its often neglected among conservative Protestants, perhaps because it is medieval and somewhat philosophical. 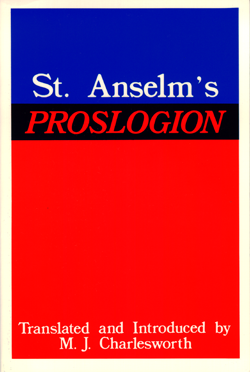 When people do discuss Proslogion, the influence of chapters 2-4 and the so-called “Ontological Argument” contained therein usually completely dominate the discussion. I have become convinced that Anselm was far more concerned with what “that than which nothing greater can be conceived” entailed for the nature of God’s existence (chapters 5-26) than what it entailed for the fact of God’s existence (chapters 2-4). And from a slow, meditative read of Charlesworth’s translation and commentary on Proslogion last June, I have become convinced that chapters 24 and 25 – those concerned with the believer’s infinite joy in God – are the highlight and climax and heart of the book. Everything, including chapters 2-4, serve to get him to this section, where Anselm’s understanding of God as a maximally great Being finds its correlate in human faith as a maximally great joy. “Surely, if any other whom you loved altogether as yourself possessed the same blessedness, your joy would be doubled, because you would rejoice not less for him than for yourself. But, if two, or three, or many more, had the same joy, you would rejoice as much for each one as for yourself, if you did love each as yourself. Therefore in that perfect love of innumerable holy angels and holy men, where none shall love another less than himself, every one shall rejoice for each of the others as for himself. I share your love of the Proslogion, Gav! Wish we could read it together. Dad, I remember all your Anselm quotes in A Passion for God! That was probably the first time I ever heard of him. A father and son who read together… how beautiful!